Master of Laws (LLM) applicants must hold a Bachelor of Laws (LLB) or Juris Doctor (JD) from a recognized university and have achieved the equivalent of a University of Toronto B+ standing in their final year. Grades from other master's degrees obtained will be reviewed, but the admitting grades for the LLM program are those obtained in the final year of the LLB or JD. If an applicant is still in the process of completing the LLB or JD at the time of application, the grades from their second-last year of the program will be averaged along with the grades available for the final year. Individuals applying to the thesis-intensive LLM program are required to demonstrate their research and writing abilities. Please note there is no presumption that successful completion of a Master of Laws (LLM) degree will lead to admission to the Doctor of Juridical Science (SJD) program. Master of Studies in Law (MSL) applicants should be established academics and scholars who already work and write in a discipline related to law, and wish to add a legal dimension to their scholarship. Eligible applicants must hold a graduate degree, ideally a doctorate, from a recognized university and have already demonstrated a high level of scholarship in a discipline related to law. Only a few individuals are accepted into this unique program every year. Eligible candidates for the Doctor of Juridical Science (SJD) program generally hold a Bachelor of Laws (LLB) or Juris Doctor (JD) and Master of Laws (LLM) from recognized universities with an excellent academic record (at least a University of Toronto B+ standing or equivalent) and have demonstrated, through substantive writing, their ability to engage in and generate high-level thought and quality research. Candidates who have achieved a minimum A- average in their Bachelor of Laws (LLB) or Juris Doctor (JD) may be considered for direct entry into the SJD program. International applicants are encouraged to compare their grades to the University of Toronto’s standard using the School of Graduate Studies’ International Degree Equivalencies Tool, which lists qualifications from a number of educational systems around the world. The academic standings listed within this tool are normally accepted as equivalent to a University of Toronto mid-B grade average, if the degree obtained was awarded from a recognized university. Please visit the website for the Global Professional Master of Laws (GPLLM) for more information about the admissions criteria for that program, which is designed for working professionals in law, business and government. Please review all of the details on the Submission of English Language Proficiency Test Scores webpage. It is essential that you have a command of the English language. If your primary language is not English and you graduated from a non-Canadian university where the language of instruction and examination was not English, you must demonstrate your facility in English by completing an English-language facility test. This language requirement should be met at the time you submit your application. Offers of admission conditional upon successful completion of an English language test cannot be offered. You are an international applicant whose primary language is not English but you have completed a degree program at a university where the language of instruction and examination has largely been in English. If you are such an international applicant, an official statement from your institution will be required, confirming the use of English as the language of instruction and examination. Several English language testing services are acceptable. The most common tests are the TOEFL or IELTS. For those writing the TOEFL the TWE (Test of Written Language) is compulsory. The minimum TOEFL score requirement is 600 with a TWE of 5 on the paper-based scale; and 100 (out of 120) on the internet based test with a 24 (out of 30) in each component. The IELTS test is available in two test formats: Academic or General Training. The Academic version of IELTS measures English language proficiency needed for an academic, higher learning environment. This is the format that is required for an application to the University of Toronto. The minimum IELTS score required is an overall score of 7.5, with at least 7 in each component. Applicants should be aware that a graduate degree in law does not qualify one for admission to the Bar in Ontario. Neither the LLM nor the SJD program is an effective vehicle for satisfying the requirements of the National Committee on Accreditation. The NCA generally requires applicants to take a number of basic first-year courses, which graduate students are disallowed from taking except in exceptional circumstances. Satisfying the requirements of the NCA is not considered to be an exceptional circumstance. If you are interested in becoming qualified to practise law in Ontario, please see NCA Options at the Faculty of Law. 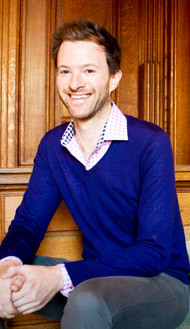 "The Faculty of Law at the University of Toronto was an obvious choice: its reputation, faculty and resources are unparalled amongst Canadian universities. Halfway through the course, I am delighted to be able to say that the LLM program has exceeded my high expectations. My instructors are international leaders in their fields, my fellow students are articulate, interesting and fun and I have access to all the academic resources I could possibly need. The LLM program itself is managed in a flexible, supportive and attentive way that allows each of student to achieve his or her objectives, as diverse as those may be. Overall, I would recommend the program in the strongest possible terms." 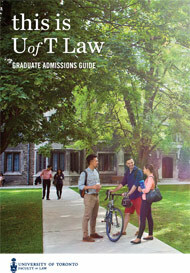 Our Graduate Program Guidebook provides an overview of our program and the admissions process for potential applicants to the University of Toronto Faculty of Law graduate program.